A summery lime, just to give a bow to the soon departing summer. . .
1. Cut and scored A Muse Studio card stock into an A2 card, setting aside the remaining half sheet to cut the monogram letters and the envelope liner. This cardstock is white on the other side, so no need to line the inside of the card with white. 2. Stamped white stripes and embossed in white. 3. Cut out initials with Silhouette. 4. Adhered initials to form my monogram on card. 5. Stamped screen image onto card stock with white ink. Because I did not emboss, however, the white ink is more pale and the look more subtle. 6. Die cut envelope liner and adhered to white envelope. 1. Stamp the stripes so your eye goes from the top left to the bottom right. This is consistent with the way we read. 2. 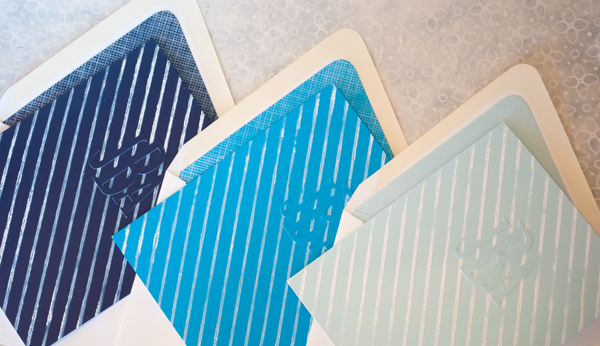 You'll get a crisper set of stripes if you use Versamark, rather than a white ink, before you emboss. MOOD WHEN DONE = Freaking Out. After 36 years, Friday was my last day as a lawyer. I start a new job on Monday. (Same agency, different office). Apparently, I like change! Beautifully crisp and simple cards, Joan. Really like that lime & white. Good luck in your new job! LOVE the lime green and am totally amazed that you were able to repeatedly stamp the stripes STRAIGHT (obviously, I am 99.9% sure that would have NEVER happened if I had attempted such a feat). Good luck on the new job!! I love your cards! Good luck in your new job. You'll do great. Beautiful CAS cards. I must start lining my envelopes more often...such a classy touch. Best of luck with the new job. I should line my envelopes too, I liket he look. You are rocking those card sets. Best wishes for Monday. I know you will be awesome there too. Love the cards! The colors are awesome! Best of luck with your new job! 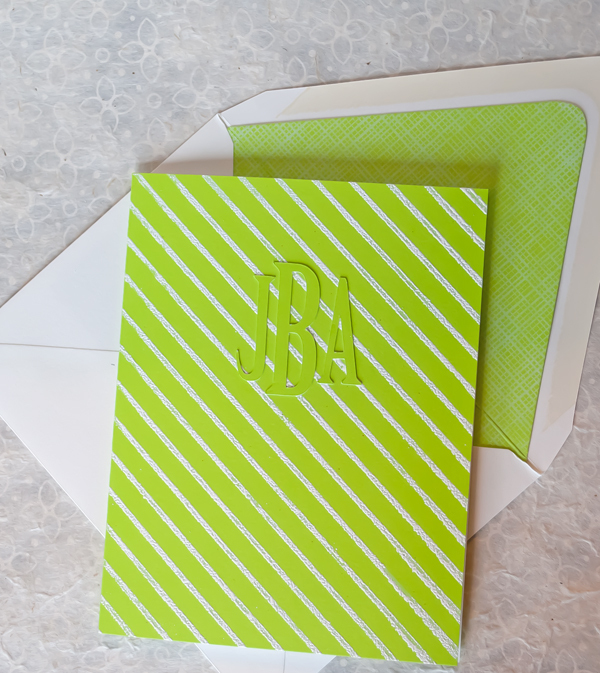 These monogrammed note cards are fantastic!!! And congratulations - hope you had a great first day!! Good luck with your life change! It's going to be fun to do something different.